A Great Power Point on Canine Body Language! If you are interested in learning more about how dogs communicate then this is a great power point designed for you. Go ahead and print it out, make notes, write in experiences you’ve had and see what triggers your dog. Many times we think we know what is going on in our dog’s head and this will give you confidence in knowing more about how your dog is feeling when exhibiting certain behaviors. What are the most important signs to look for? What is it about a look that a dog gives me that lets me know how he is feeling? Thank you BlueDogTraining.com for this great information! Posted on December 14, 2011 Categories Behavior, TrainingLeave a comment on A Great Power Point on Canine Body Language! Locally Made Dog Treats and Toys from B.W. Barkery! Does your dog like their treats? Posted on November 18, 2011 Categories Locally madeLeave a comment on Locally Made Dog Treats and Toys from B.W. Barkery! Impact Case and Container makes some long lasting, collapsible crates right in Rathdrum! 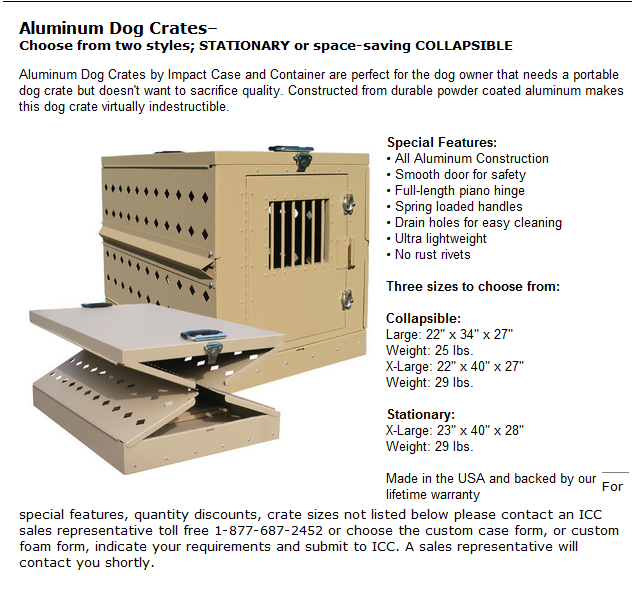 Posted on November 18, 2011 Categories Locally madeLeave a comment on Locally Made Dog Crates! 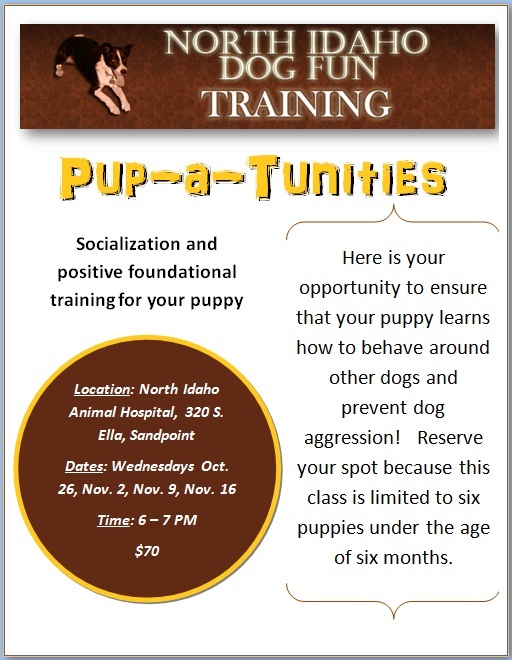 Puppy Socialization and Foundational Training Class in Sandpoint Starts Wednesday, Oct. 26th! Call 208-627-8134 or 208-265-5700 for more info or to sign up! Posted on October 19, 2011 Categories News, TrainingLeave a comment on Puppy Socialization and Foundational Training Class in Sandpoint Starts Wednesday, Oct. 26th! Locally Made Anticeptic Specifically For Dog Pads! Handhills Tuff N Up is a great product to help out dogs with cut, torn or worn down pads. This is a solution that you put on your dog’s pads to help your dog’s feet “tuff n up” and prepare for the snow or just for a long hike or a jog on pavement. I have more than one friend who took their dog for a bike ride and their dog ran until he had worn his pads so low they actually bled – a lot. Sled dog mushers, sheep herders and agility people all know the importance of keeping their dog’s feet healthy and are proactive about it but it is just as important for weekend warriors. This product is safe and doesn’t have any artificial dyes like similar products out there. If you herd you know Handhills out of Coeur d’Alene and they only sell products that they use on their own dogs. 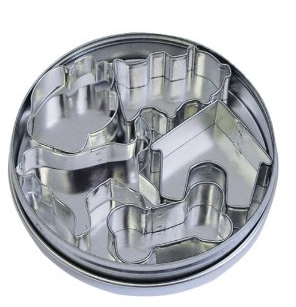 Click here to visit their website where you can order online. I love the photos they have of how fast pads heal with Tuff N Up! Posted on September 28, 2011 Categories Locally madeLeave a comment on Locally Made Anticeptic Specifically For Dog Pads! 2011 Sled Dog Training Class! 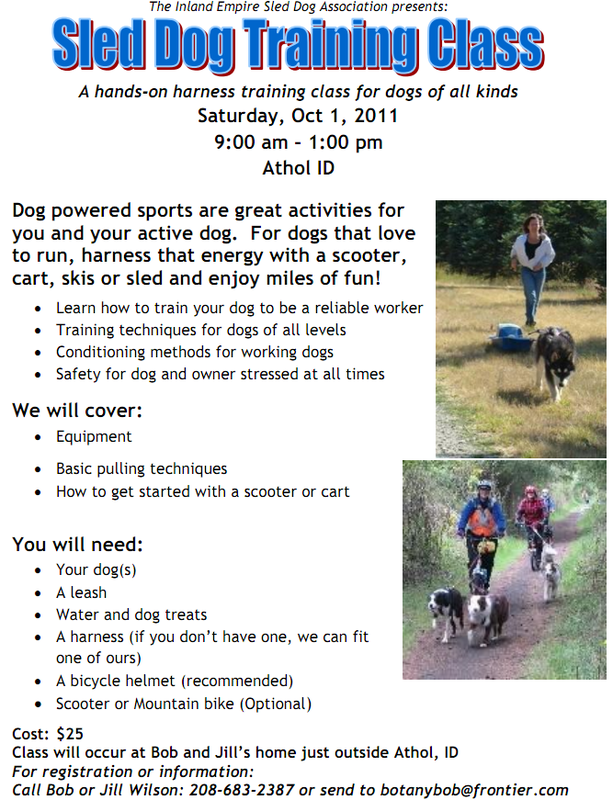 Posted on September 21, 2011 Categories News, TrainingLeave a comment on 2011 Sled Dog Training Class! Posted on September 19, 2011 Categories Locally madeLeave a comment on Locally Made Dog Gear!